Received: August 9, 2018; Revised: September 20, 2018; Accepted: September 27, 2018.; Published online: February 5, 2019. Primary malignant fibrous histiocytoma (MFH) of the chest wall is extremely rare and is characterized by aggressive features, including a high incidence of local recurrence and distant metastasis. Surgical resection of the chest wall is the primary modality of management. However, surgical treatment is not generally recommended in patients with evidence of distant metastasis. Here, we present a case of chest wall MFH along with a schwannoma mimicking distant metastasis in the right upper arm. The patient was treated by radical en bloc resection and survived for more than 9 years without recurrence. A 61-year-old man was referred to Uijeongbu St. Mary’s Hospital with a pathologic diagnosis of suspected malignancy. He had undergone partial resection of a painful mass on the left chest wall at a different medical facility 10 days prior to the referral. 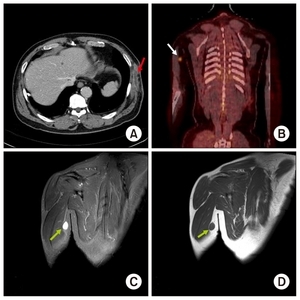 The size of the preoperative mass was reported as approximately 5×4.5×4 cm in the transfer summary, and preoperative chest computed tomography (CT) had not been performed. The patient’s medical history was remarkable for hypertension. Laboratory findings were all within normal limits. Available imaging studies included chest radiography, chest CT, a whole-body bone scan, and positron emission tomography (PET)/CT utilizing fluorine-18 fluoro-2-deoxy-D-glucose (FDG). Chest CT revealed a residual mass on the left lower chest wall (Fig. 1A). Mediastinal lymph node enlargement was not noted, and there was no evidence of hematogenous or lymphangitic metastasis in either lung. Malignant fibrous histiocytoma (MFH) was confirmed by ultrasound-guided fine-needle aspiration biopsy of the chest wall mass (Fig. 2A). A whole-body bone scan showed no bony involvement. PET/CT revealed a suspected metastatic lesion in the right upper arm (maximum standardized uptake value [SUVmax]=3.57) (Fig. 1B), while the SUVmax of the chest wall mass was 3.53. Magnetic resonance imaging (MRI) of the right arm also suggested a solid tumor, such as MFH (Fig. 1C, D). Ultrasound-guided fine-needle aspiration biopsy of the right upper arm mass was conducted and confirmed the diagnosis of schwannoma (Fig. 2B). The operation was performed on April 11, 2008. The tumor margin was inaccurate because of a previous partial resection. Thus, based on the operative scar, transfer summary, and chest CT findings, the entire chest wall was radically resected, including the sixth to eighth ribs, while securing a safety margin of approximately 4 cm. No pleural adhesion was observed. The chest wall defect was reconstructed using 2 sheets of Marlex mesh and a latissimus dorsi myocutaneous flap (Fig. 3A, B). The schwannoma in the right arm was simultaneously excised. The postoperative course was uneventful and the resection margins were microscopically clear. The patient was treated with postoperative radiation (54 Gy) and was placed under observation as an outpatient for over 9 years, during which period no evidence of recurrence was observed. This study was approved by the institutional review board (IRB approval no., UC13ZISE0103). Written informed consent was obtained from the patient for publication of this manuscript and any accompanying images. MFH is the commonest soft-tissue sarcoma in adults, accounting for approximately 20% of all soft-tissue sarcomas . It most frequently arises in the deep tissues of the lower limbs (51%), followed by the upper limbs (24%), trunk (16%), and retroperitoneum (9%); however, it rarely appears on the chest wall . MFH demonstrates aggressive behavior with a high propensity for local recurrence, distant metastasis, and a short survival time. In the study by Weiss and Enzinger , the local recurrence rate of MFH was reported to be 44% and the rate of metastasis was 42%. The benefits of either chemotherapy or radiation therapy as primary or adjuvant treatment methods for MFH are unclear . In chest wall MFHs, the mean survival time has been reported as 11.7 months in patients without surgery and 23.2 months in those who underwent a surgical procedure . The local recurrence rate of MFH was 85.7% in patients who underwent resection alone, and 40.8% in those who underwent wide excision . Few studies have documented the prognostic factors for soft-tissue sarcomas, including MFH, in the chest wall . The clinical behavior of soft-tissue sarcomas in the chest wall is similar to that in the extremities . The Union for International Cancer Control/American Joint Committee on Cancer stages I and II, superficial location, myxoid type, and less than 50 years of age have been reported as favorable factors for MFH . Nevertheless, in the current study, the patient did not have any of these favorable factors. Early diagnosis and radical resection are crucial for successful treatment . The benefits of resection of the margin has been widely discussed because the extent of resection is closely associated with radical resection, which is crucial for prolonging survival and reducing postoperative recurrence [5,7]. King et al. recommended an excisional distance of 4 cm, whereas Yoshida et al. reported that patients who underwent wide resections with negative surgical margins survived without recurrence during follow-up, irrespective of the excisional distance. In this case study, we excised 4 cm around what we estimated to have been the tumor margin, because the tumor margin was inaccurate due to the unavailability of preoperative chest CT. Moreover, intraoperative frozen sections from huge specimens, including bony structures, are of limited value. Soft-tissue sarcoma with extrapulmonary metastasis is generally treated using chemotherapy. In the current case, PET/CT and MRI revealed distant metastasis (Fig. 1B–D), and the patient was not a candidate for surgery prior to tissue confirmation. While the uptake of FDG in schwannoma is high, the reason for this increase is unclear. Thus, FDG PET/CT has limited value in distinguishing schwannoma from soft-tissue sarcoma . Furthermore, MRI cannot differentiate between schwannomas and malignant tumors . Thus, we believe that PET radiotracers should be actively investigated. Further studies employing imaging and biopsy techniques are advised for a definitive diagnosis. This report presents the case of a patient with MFH in the chest wall, which appeared to be adequately controlled by radical en bloc resection. Additionally, the patient presented with a benign schwannoma mimicking distant metastasis. The appearance of focal FDG uptake on PET/CT might indicate a benign tumor, such as schwannoma, or metastasis. However, owing to difficulties in differentiating between schwannoma and a malignant tumor using imaging alone, pathological confirmation is very important prior to the formulation of a treatment plan for MFH. Fig. 1. Radiologic findings of the lesions. (A) Chest CT showing a residual mass in the left lower chest wall (red arrow). (B) Positron emission tomography/CT showing increased fluorine-18 fluoro-2-deoxy-D-glucose uptake in the right upper arm (white arrow). (C, D) Magnetic resonance imaging showing a well-defined subcutaneous mass with low T1 and high T2 signal intensities in the right upper arm (green arrows). CT, computed tomography. Fig. 2. Pathologic findings of the lesion. (A) Storiform arrangement of malignant cells with plump cytoplasm and the presence of a few mitotic figures suggesting storiform-pleomorphic malignant fibrous histiocytoma (H&E stain, ×200). (B) Typical features with areas of varying cellularity, thick-walled blood vessels, and Verocay bodies (H&E stain, ×200). Fig. 3. Intraoperative images of the patient. (A) The defect was reconstructed with 2 sheets of Marlex mesh. (B) The defect was reconstructed with a latissimus dorsi myocutaneous flap. Kearney, MM, Soule, EH, and Ivins, JC (1980). Malignant fibrous histiocytoma: a retrospective study of 167 cases. Cancer. 45, 167-78. Weiss, SW, and Enzinger, FM (1978). Malignant fibrous histiocytoma: an analysis of 200 cases. Cancer. 41, 2250-66. Sawai, H, Kamiya, A, Kurahashi, S, Yamanaka, Y, and Manabe, T (1998). Malignant fibrous histiocytoma originating from the chest wall: report of a case and collective review of cases. Surg Today. 28, 459-63. Yoshida, N, Miyanari, N, Yamamoto, Y, and Egami, H (2006). Successful treatment of malignant fibrous histiocytoma originating in the chest wall: report of a case. Surg Today. 36, 14-21. Gross, JL, Younes, RN, Haddad, FJ, Deheinzelin, D, Pinto, CA, and Costa, ML (2005). Soft-tissue sarcomas of the chest wall: prognostic factors. Chest. 127, 902-8. Krishnamurthy, A, Ramshankar, V, and Majhi, U (2013). Malignant fibrous histiocytoma of the chest wall: a rare differential. South Asian J Cancer. 2, 185. King, RM, Pairolero, PC, Trastek, VF, Piehler, JM, Payne, WS, and Bernatz, PE (1986). Primary chest wall tumors: factors affecting survival. Ann Thorac Surg. 41, 597-601. Ahmed, AR, Watanabe, H, Aoki, J, Shinozaki, T, and Takagishi, K (2001). Schwannoma of the extremities: the role of PET in preoperative planning. Eur J Nucl Med. 28, 1541-51.